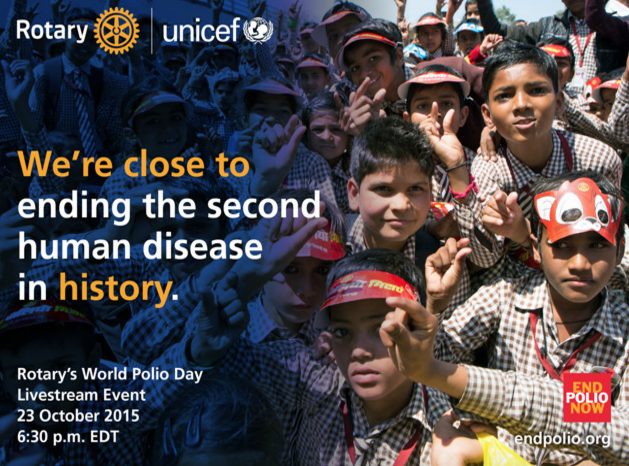 What are you and your club doing to celebrate World Polio Day? Rotary International and the U.S. Centers for Disease Control and Prevention (CDC) will be joining together for the 4th Annual World Polio Day event on Monday, 24 October. More than 50,000 viewers around the world will join together in viewing the live stream event. We will be joined by celebrities and experts to share our progress on the road to polio eradication. If you haven't yet made a plan, consider joining up together in a club member's home to watch the live streaming event at endpolio.org. Share the live-stream and educate your social media network about the campaign to #endpolio. Spearheading the most successful global health partnership in history with the launch of PolioPlus in 1985, we have nearly eradicated polio, one of the world's most feared diseases, from the face of the earth. Polio remains endemic in only three countries: Pakistan, Afghanistan and Nigeria. For up-to-date statistics on polio, updated weekly, visit PolioEradication.org. 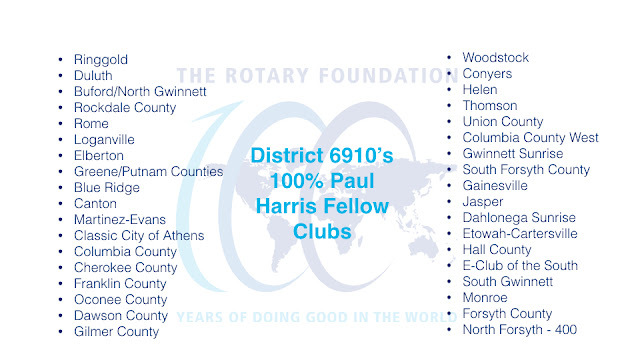 Committed to supporting PolioPlus, our Rotary District 6910 recently made a contribution of $38,450 from our Rotary Foundation District Designated Fund to PolioPlus. Based on funding requirements to continue this campaign of eradicating polio through 2019, a funding gap of $1.24 billion exists. Therefore, it is vital we continue to support this campaign. Many clubs have fundraisers specifically designated for PolioPlus. Not only does this raise needed funds, it raises awareness of our PolioPlus fund and lets our communities know that we as Rotarians are a vital part of the EndPolio campaign. 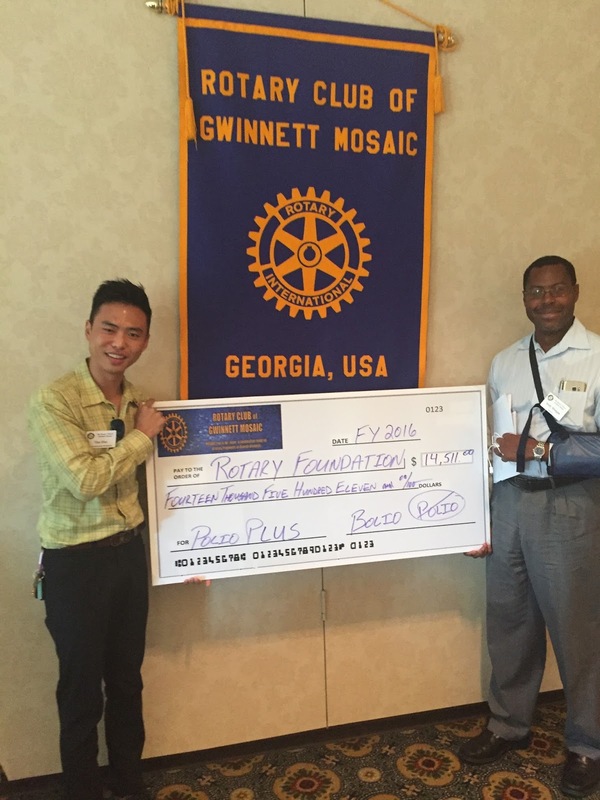 Rotary Club of Gwinnett Mosaic is a 25 member club committed to EndPolio. Their bowling fundraiser "Bowlio" raised a total of $14,511 for Polio Plus. We have not seen a case of polio in India since 2011, yet the government still holds National Immunization Days (NID) twice a year as it is still important, especially in high risk areas, that children continue to receive immunizations. The goal is that each child under five receive two drops of oral vaccine. The scale of this is extraordinary with more than 172 million children vaccinators who visit more than 209 million homes in every city, town and village across the country. Since becoming involved in Rotary, I have always wanted to be involved in NID. In February, David and I will have the opportunity to visit India as part of a team of Rotarians participating in this NID. If you are interested in going as a part of this team, please email me, to let me know. The tentative departure date is 29 Jan 2017 returning 8 Feb 2017. We will celebrate 100 years of The Rotary Foundation in Atlanta at The Rotary International Convention, kicking it off with a Million Dollar Dinner on 9 June. I hope to see you there. Contact Rich Panyik for more information on the Million Dollar Dinner (you don't have to give a million dollars to be invited, but we'd love it if you did). Volunteer opportunities are now open at the convention website. I hope you'll get registered for the convention and also as a volunteer as we hope to show a record number of Rotarians what southern hospitality is all about. Polio eradication is our #1 external goal. 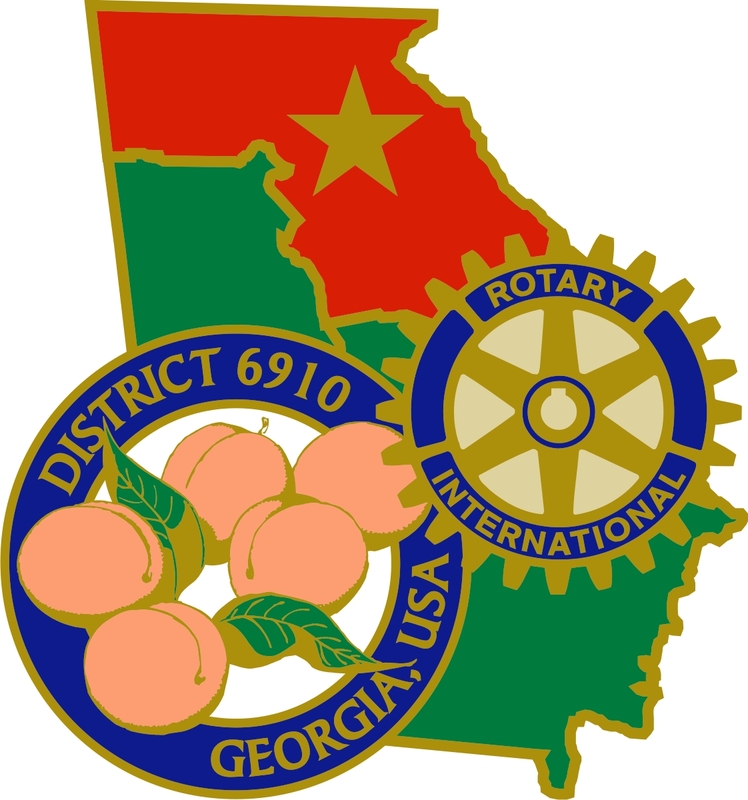 With membership our #1 internal goal, here's an membership update: We are the number one district in Georgia year to date in membership growth with 23 new members as of 30 September. But this means we are behind if we are to accomplish our goal of at least net 200 member growth by 30 June. 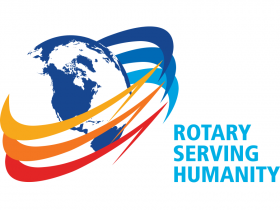 I hope you'll be thinking about who you can bring into Rotary this year. Thank you for all you do to keep our organization relevant and a vital part of our communities and the world, Rotary Serving Humanity.